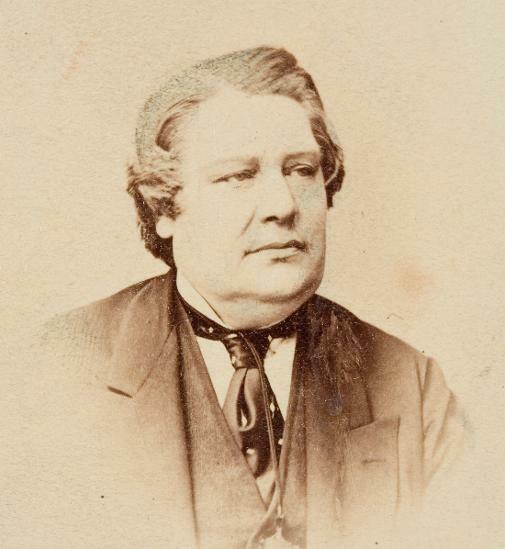 Joseph Austin Benwell married Marian Boulton (1821-1892), also said to be an artist, at the Church of St George, Bloomsbury, London on 13 July 1854. There are no records to date of any surviving children or descendents. He had nine siblings, several of whom died whilst still quite young. The author is directly descended from Joseph Austin Benwell's elder sister, Charlotte Olivia Benwell (1811-1883). Members of his family were active in the Society of Friends, or Quaker, movement and had been since the late 17th century in Berkshire, Oxfordshire and later Somerset and Bristol. The Benwell family can be traced back to at least the mid-16th century in Berkshire and southern Oxfordshire, where they were yeoman farmers and landowners mainly in the Rotherfield Peppard and Rotherfield Greys area. Joseph Austin Benwell’s father, Joseph Benwell (1783-1864) was born in Yatton, Somerset on 12 December 1783, the only surviving son of John (1749-1824) and Martha Benwell. Please refer to the panel below for further information. Joseph Austin Benwell’s paternal grandfather, John Benwell (1749-1824) married Martha West (a widow, nee Stanbrook) at the Quakers’ Assembly Hall in Gracechurch Street, City of London, on 15 May 1771. John was recorded as being a ‘Cheesemonger’ on his marriage record, no doubt in connection with the family farming business in Berkshire. He soon became a schoolmaster in Somerset from the mid 1770s, and went on to found Sidcot School, the Quaker school in Somerset, in 1808. He was also the author of the posthumously-published ‘Extracts from a Diary kept by the late John Benwell of Sidcot; also Extracts from Letters addressed to different branches of his family’ (1825). Henry Benwell was the son of Thomas Benwell (1656-1723) and his third wife Mary (Wilson), who married in Reading in 1700. They also lived at Whitley Park Farm. Thomas Benwell’s complicated and lengthy will (1723) includes various members of his large family, and indicates he was quite an entrepreneur, owning land and properties in Berkshire and South Oxfordshire, including in the Henley-on-Thames area. Thomas Benwell (1656-1723) was a younger son of Henry Benwell (b. c1620) and Grace (Pardis) of the Rotherfield Peppard/Greys area of Oxfordshire. Henry Benwell’s parents were William Benwell (b. 1581) and Joan (Rownde). As far as can be ascertained, William’s father was another Henry Benwell, who would have been born around the mid 1500s. It is recorded that before this branch of the family moved to Whitley Park Farm, the Benwell family occupied a large farm a few miles away near Henley-on-Thames from 1575 to the early 19th century. Joseph Austin Benwell's family tree can be seen on Ancestry.co.uk (a subscription website) on the 'Stone, Taylor, Benwell and Bourchier' member tree, or search for by name. Joseph Austin Benwell’s great grandmother Hannah (Smith) was baptised at St Mary’s, Mapledurwell, Hampshire on 19 January 1717, where she later married Henry Benwell on 13 September 1741. Hannah’s father was Henry Smith, born in 1685, one of a line of Henry Smiths of Mapledurwell going back to at least the 16th century. The village has been the subject of a study by Victoria County History, which has on it website a number of transcribed wills and inventories of the Smith family of Mapledurwell, who were local yeoman farmers and maltsters and described as a ‘powerful local family’. Henry Smith (1685) married Elizabeth Green (1686) - they were Joseph Austin Benwell’s 2xgreat grandparents. Elizabeth Green was born in Weston Corbett, Hampshire and was baptised on 22 September 1686 at the local parish church of St Lawrence, Weston Patrick. She was from a long line of the Green family, who built a house and farmed at what became known as ‘The Farm’, now Weston Corbett House. A John Grene held land in Weston Corbett before his death around 1587, and he may well have been a forebear of Joseph Austin Benwell. Elizabeth Green’s parents were George Green and Elizabeth- Benwell’s 3xgreat grandparents. He may be the George Green whose initials GG are on a framed remnant of an altarcloth dated 1682, which hangs in the nave. A later George Green (1774-1853) was the last of the direct line of Greens at Weston Corbett, and he left land and Weston Corbett House to his godson Thomas Henry Wyatt (junior, b.1841) and his brother Matthew Digby Wyatt, from the Wyatt family of architects. Their father, Thomas Henry Wyatt (1807-1880), said to be a kinsman or cousin of George Green, designed and rebuilt the Church of St Lawrence in Weston Patrick in the 1860s. Little is known of where any artistic talents may have come from in the family. However, Joseph Austin Benwell’s first cousin, William Arnee Frank (1809-1897), the son of his aunt Hannah Benwell, was also an artist who published a series of lithographs of Bristol views in 1831 held at the Fitzwilliam Museum, Cambridge. His landscape watercolours were mostly of views around Bristol, the Wye Valley and North Wales. He was active well into his eighties and was still showing work at the West of England Academy in 1891. 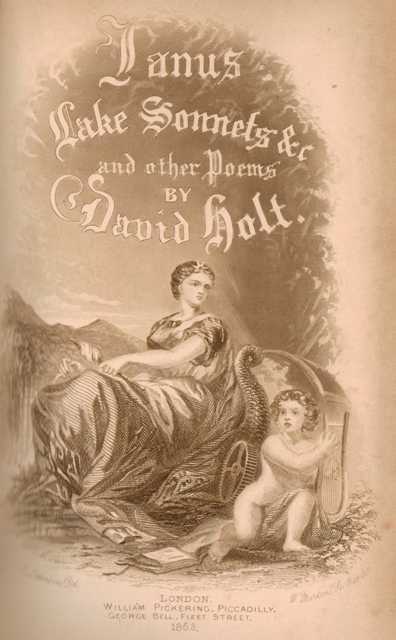 Another first cousin, son of his aunt Rebecca Benwell, and another grandson of John Benwell, was David Holt (1828-1880), a published poet ('Poems, Rural and Miscellaneous', publ. Gillett 1846; 'A Lay of Hero Worship, and other poems', publ. Pickering, 1850; 'Janus, Lake Sonnets etc. and other Poems', publ. George Bell, 1853; and 'Poems by David Holt' publ. Simpkin, Marshall & Co, Paternoster Row, 1868). Please refer to the section below for more information. His second cousin (once-removed) was Thomas Benwell Latchmore (1832-1908), the photographer of Hitchin, known for documenting Hitchin photographically from the early 1860s. Another cousin taught art and drawing at a Quaker school. Benwell’s third cousins were Francis May (1803-1885), who co-founded the Bryant and May match company, and his brother Charles May (1801-1860), who manufactured astronomical equipment and constructed the Airy Transit Circle and the Greenwich Altazimuth at the Royal Observatory, Greenwich, amongst other achievements. Joseph Benwell senior was born on 12 December 1783 at Yatton, Somerset. Joseph was the only surviving son of John (1749-1824) and Martha Benwell. The ‘Register of Births belonging to the Quarterly Meeting of Somerset from 1776 to 1794’ show that his father John Benwell was a Schoolmaster. Joseph married Charlotte White in Westbury-on-Trym, Bristol, on 15 February 1808. Joseph and Charlotte resided for some years in London between about 1810 and 1824, where several children were born, before moving back to the Bristol area. All their children were registered in Society of Friends records. Joseph Benwell worked as an accountant all his life. Records from the Bristol Mercury also show him offering tuition in Latin, French and book-keeping in 1842. Joseph Benwell died in Mall Place, Clifton, Bristol in 1864. The author has researched evidence that shows it is extremely likely that Joseph Austin Benwell's elder brother John Benwell (born 21 March 1814, London) is the John Benwell who wrote the book 'An Englishman's Travels in America - Life and Manners in the Free and Slave States' (1853, 1857). 1. Research into Census and other records on all John Benwells living at the time indicate there are virtually no other likely candidates. 2. Dates/ages of John Benwell are about right - born 1814, travelled in the late 1830s/1840. 3. Family background - this John Benwell was from a Quaker/Society of Friends background (also mentioned in the book). The book is anti-slavery and Quakers were the first corporate body to condemn slavery. 4. John's grandfather John Benwell (1749) was a man of strong religious beliefs, founder of a Quaker school and also a writer- 'Extracts from A Diary kept by the late John Benwell of Sidcot....' (posthumously in 1825). Also, John, being the eldest son of the family, may have been named after his grandfather, John Benwell senior, as was often common practice then. Both were ‘diarists’ and keen on recording events. 5. John Benwell, author of 'An Englishman's Travels in America.....' left from the port of Bristol on ship the Cosmo for New York, and spent 4 years in North America in the late 1830s until about 1840. The actual dates of his ‘travels’ are referenced in the John Benwell Papers 1846-1852 held in the Library of Congress: "On the Moral and Physical Condition of the Slave in North America," describing Benwell's travels through the southern United States in 1840 and his observations on slavery…”. This was just prior to him returning back to England, from Charleston to the port of Liverpool, at the end of the four years in late 1840/early 1841. Previously “At Fort Anderson, he met General Zachery Taylor, leader of American forces in an 1837 campaign against the Indians…”, and "He witnessed a campaign against the Seminole and Cherokee Indians…”, which was in 1837. In the 1841 Census, John (age 27) is residing with parents Joseph and Charlotte in Bristol. His brother Joseph Austin Benwell used to reside with his parents after his travels too, which makes sense as young men they would not have had the time to set up homes of their own. 6. ‘Incidents of travel. Being a narrative of four years in the United States, and territories of America ‘ by John Benwell was published in 1852, Bristol, England. This preliminary version was published a year before ‘An Englishman’s Travels in America’ (1853). Local history and manuscript collections in Illinois (Newberry Library, Chicago) refer to “’Incidents of travel’, which is a narrative of four years spent in the United States by John Benwell of Bristol, England, written in 1852“. This is another fact linking Benwell with Bristol. The 1851 Census shows John Benwell, Joseph Austin Benwell’s brother, as being resident at Rock House, Bristol at about this time. 7. John Benwell's children were in various census records listed as living with their grandparents Joseph and Charlotte, also an aunt/uncle. This could be indicative of a man who travelled and may not have been able to care for them on a day-to-day basis. 8. Records indicate that this John Benwell died in Manchester in 1863. A death notice in the Western Daily Press dated 11 July 1863 states: 'John Benwell, 49, accountant, late of Bristol, died Manchester 5 July 1863.' He was also living in Manchester at the time of his marriage in 1843. The record of his marriage to Harriet Clark at Frenchay Church, Bristol 24 July 1843, states: Occupation- Accountant (“currently residing Manchester”). It is possible that, after returning from his travels via the port of Liverpool, he found Manchester an amenable place in which to settle. His abode at time of death was Embden Street, Greenheys, Chorlton-on-Medlock. His aunt, Rebecca Benwell, had married the philanthropic cotton manufacturer David Holt, and the family also lived in the Chorlton-on-Medlock area of Manchester. Their only son and John’s first cousin was David Holt (1828-80), a published poet who later moved to Bowdon, Greater Manchester. Manchester was a centre of the anti-slavery movement in the late eighteenth and the nineteenth centuries, many abolitionists being Quakers. It seems that John Benwell adopted the middle name 'Alexander' (refer below). He married for the second time on 20 July 1861 at Bowdon Church, Altrincham (south of Manchester), his second wife being a widow, Elizabeth Blagbrough (nee Thatcher). The marriage record shows his father as Joseph Benwell. John Alexander Benwell was buried on 9 July 1863 at St Luke's, Cheetham, Manchester. The church is now derelict, with only the tower remaining. Sadly, it appears that the graveyard is currently inaccessible to the public. 9. Signatures are very similar (see below), despite the signatures being from sources that are some years apart. Compare that on the document "On the Moral and Physical Condition of the Slave in North America" (John Benwell papers 1846-52) describing Benwell's travels through the southern United States in 1840 and his observations on slavery, the railroads and the writings of Harriet Beecher Stowe, and that on his second marriage record (as John Alexander Benwell) in July 1861 (right). 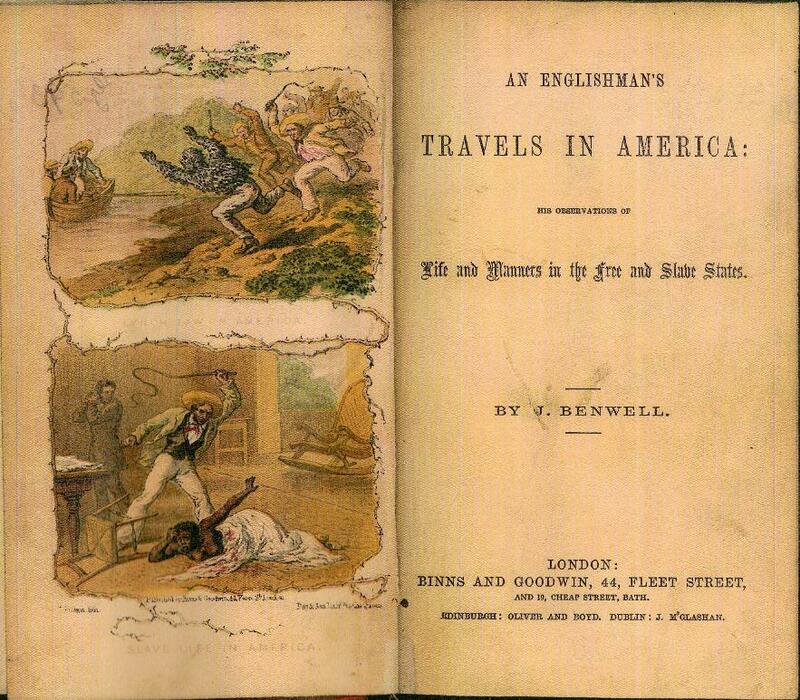 Below is shown the title page of 'An Englishman's Travels in America: his observations of Life and Manners in the Free and Slave States' by John Benwell, published in 1853 by Binns and Goodwin, 44 Fleet Street, London and 19 Cheap Street, Bath. The frontispiece comprises two somewhat harrowing illustrations which are entitled 'Lynch Law in America' (upper) and 'Slave Life in America' (lower). T Picken lith., Day & Son, lithographers to the Queen. Another 1853 edition, in the HathiTrust digital collection (original in the Library of Congress), has a very different frontispiece of an engraving by W H Egleton of a woman who looks to be Quaker in appearance. John Benwell - Pseudonym or Not? It has been suggested that the name John Benwell, as author of ‘An Englishman’s Travels in America’ (1853). was a pseudonym, in particular by reference to ‘Initials and pseudonyms : a Dictionary of Literary Disguises’ by William Cushing 1885 (published by Thomas Y Crowell & Co.). I recently re-visited this issue (February 2018). Having researched in more detail, I now believe this to be a misinterpretation of the facts presented in the book. If you read the Preface, it is quite clear that the first part of the dictionary gives the initials and pseudonyms, followed by the real names of the authors. So in Part One we have the entry “Englishman, An. John Benwell. Travels in America, 1853’. The second part contains the real names of the authors, followed by initials and pseudonyms, and short biographical notes (where appropriate). So in the second part of the book, we have the corresponding entry ‘Benwell, John. An Englishman. An English traveller in America.’ There is no reference to any other name or person, as in some of the entries. If John Benwell was a pseudonym, the true name would be given in Part 2. Therefore, “An Englishman” is the pseudonym for John Benwell, and John Benwell is the real name of the author! In fact there are many similar examples in the dictionary. A pseudonym is not necessarily a third party/another real person. It can be a short description of how a person is known, such as ‘An Englishman’, or ‘An Aged Parson’ and so on. I therefore refute any suggestions that John Benwell was a pseudonym for another person/author, based on this together with other evidence presented on this website. John Benwell is the correct name of the author of ‘An Englishman’s Travels in America’. Extracts from ‘Initials and pseudonyms : a Dictionary of Literary Disguises’ by William Cushing 1885. The early (1853) and later (1857) editions of “An Englishman’s Travels” seem to show the author as J. Benwell, rather than the full name ‘John’ (see above). At what stage did the name ‘John Benwell’ appear as author on title pages? It has been confirmed by the Library of Congress that the full name John Benwell appears on the earlier John Benwell papers 1846-1852: "On the Moral and Physical Condition of the Slave in North America”. (see below). Also the Newberry Library, Chicago confirms the full name John Benwell appears on the title page of the manuscript "Incidents of Travel. Being a Narrative of four years in the United States, and Territories of America" (1852). To complicate matters further, I found the following reference in the “London Catalogue of Books: Published in Great Britain 1831-1855”, Thomas Hodgson, publ. 1855, which lists J A Benwell as the author of “Travels in the Free and Slave States of America”. This of course could be a straightforward error, but maybe it begs the question- was Joseph Austin Benwell in fact the true author? Did he use his diarist grandfather John Benwell’s name as a pseudonym? And if so, why? Certainly we know J A Benwell travelled widely, and there was a time-slot when as a young man he could have travelled to America in the late 1830s before commencing work for the East India Company and going to India in the 1840s. On returning from India at the end of the 1840s (he is absent from the 1841 census, and the 1851 census shows him as residing with his parents in Bristol) there would have been time to write and seek publication for any travel diaries he had kept earlier. However, as he later became an artist, why did he not execute the frontispiece of the book himself? This is all conjecture, but interesting nonetheless. Another, more likely, explanation that I have discovered more recently is that later records (second marriage in 1861, and death in 1863) show John to have adopted the middle name 'Alexander'. His signature on the marriage record in 1861 (above right) is very similar in style to the much earlier signature (minus the middle name), particularly the formation of the letter B. Below is shown the title page and first page of Joseph Austin and John Benwell's grandfather's book, ‘Extracts from a Diary kept by the late John Benwell of Sidcot...' (1825), and a painting of Whitley Park Farm, Reading (c1860), where Joseph Austin Benwell's grandfather John Benwell was born, and where his great grandparents and 2xgreat grandparents lived in the 18th century. The image of John Benwell is from 'A History of Sidcot School 1808-1908, A Hundred Years of West Country Quaker Education' by Francis A Knight. "His parents being engaged in a farm, and this their son averse to that employ, he sojourned some years in London, and there married Martha West..." "He kept a considerable boarding school for many years, at Yatton and Sidcot, a little west of Bristol, much to the satisfaction of those who entrusted their children to his care, who were greatly the objects of his solicitude". "...his house was open to a great number of his friends, where they were met with hospitable and agreeable entertainment, he being a cheerful and pleasant companion." ..." He was.. a valuable and upright pillar in our society...." "...our friend was favoured with a mind superior to many..."
The Diary begins in the year 1809 when John was 60, but he was a diarist long before this, as stated at the beginning: "Memorandums of this kind, were begun by me about the year 1777, but are until this time destroyed. Inclination however still prompts to a continuance of them." John and Martha ran the school in an honorary capacity until 1810, then moved to Pensford before returning to Oakridge. He was still actively involved in the school, serving on Sidcot School committee for several years. They moved to Sidcot Farm, where John died on 3 January 1824. John Benwell (1749-1824) , Grandfather of Joseph Austin Benwell, John Benwell, William Arnee Frank (artist) and David Holt (poet). Image from 'A History of Sidcot School 1808-1908, A Hundred Years of West Country Quaker Education' by Francis A Knight. David Holt, a published poet, was a first cousin of Joseph Austin Benwell, and another grandson of John Benwell of Sidcot. He was the only child of David Holt senior (1764-1846) of Manchester and his second wife, Rebecca Benwell (1787-1866), daughter of John Benwell of Sidcot and sister to Joseph Benwell (1783-1864). He was born on 13 November 1828 at Chorlton-on-Medlock, Manchester. David Holt married Sarah (Sally) Perrin (1831-1893) at Heaton Norris on 6 August 1853, and they spent their honeymoon at Nab Cottage, Rydal, Cumberland, one of several sojourns to the Lake District. He became Assistant Secretary of the Lancashire and Yorkshire Railway Company, and from the early 1860s lived in Altrincham and Bowdon. After his marriage he left the Quakers, as he was ‘disowned’ because of his marriage by a priest, and he joined the Church of England. David was connected with various literary and artistic societies in Manchester, including the Octagon Club, the Manchester Shakespearean Society, the Athenaeum Dramatic Reading Society, the Letherbrow Club, and was instrumental in forming the Manchester Book Club and The Review Club. He was church warden at St John’s Church, Altrincham for seven years. David Holt died on 26 April 1880, and is buried at St Mary’s Church, Bowdon. One of his three sons, Oliver Stanbrooke Holt (1855-1930) followed him into the railway industry, where he had a distinguished career and went on to become Secretary of the Great Central Railway Company from 1892 until his retirement at the end of 1917. 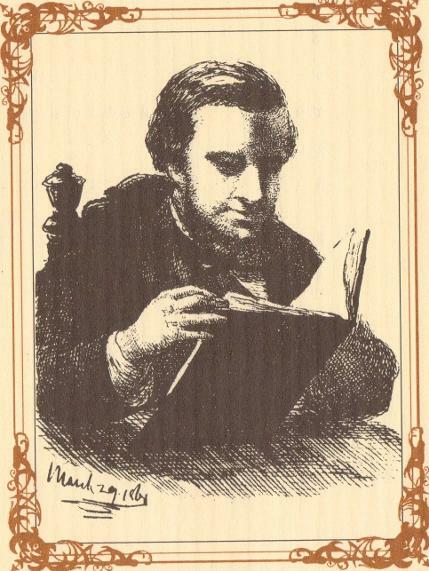 The above portrait of David Holt is from a book ‘David Holt’s Victorian Walks - A Three Days’ Ramble in the Lake District in the Spring of 1856’ published in 1994 by Greater Manchester County Record Office & Cumbria Archives Service. The book is based on David Holt’s diaries, and contains a detailed account of a walk he and his wife undertook in 1856, first catching a train to Shap, and walking back to Windermere to catch a train home. The book follows his route, adapted for the modern rambler, and includes eight maps. 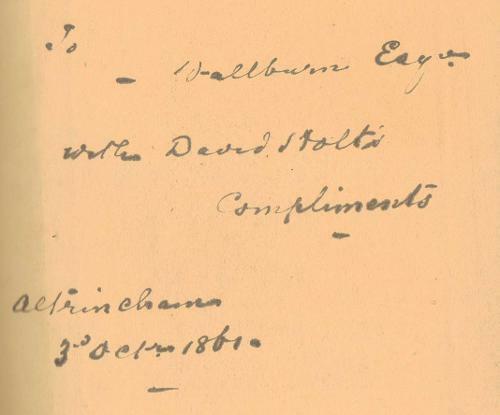 Other walks included in David Holt’s ‘Record of Rambles’ were ‘Derwentwater, Borrowdale and the Hollows’; ‘A Ramble in Wharfedale’; ‘Rough Notes of a Three days’ Retirement from Business at ‘The Isaak Walton’ nigh to Dovedale in March 1857’; ‘A Four Days’ Ramble in North Wales in August 1858’; ‘Rough Notes of a few days’ Retirement from Business in the Lake District in August 1863’; ‘A Day’s Ramble through ‘The Dukeries’ and a portion of old Sherwood’; ‘A Day’s Ramble through the Valleys of the Derbyshire Wye’; and ‘A Ramble to Bolton Abbey and Wharfedale by way of Blackburn, Clitheroe, and Skipton in September 1854’. Sadly, the only one that was published was the ‘Three Days’ Ramble’ in 1994, the others in the series never materialised. Maybe there is scope for publishing some of the others in the future! First paragraphs of a review of 'A Lay of Hero Worship, and other Poems', published in The Morning Post 12 September 1850. David Holt's poetry was likened to that of Alfred, Lord Tennyson. Sonnet - The Dreamer' by David Holt. From 'Janus, Lake Sonnets etc,. and other Poems' (1853). This image from 'Verses Grave and Gay: Sonnets, Lyrics and Ballads. Drawn chiefly from the Transactions of The Letherbrow Club' by Thomas Letherbrow and Friends (private publ. 1910, John Heywood, Manchester). 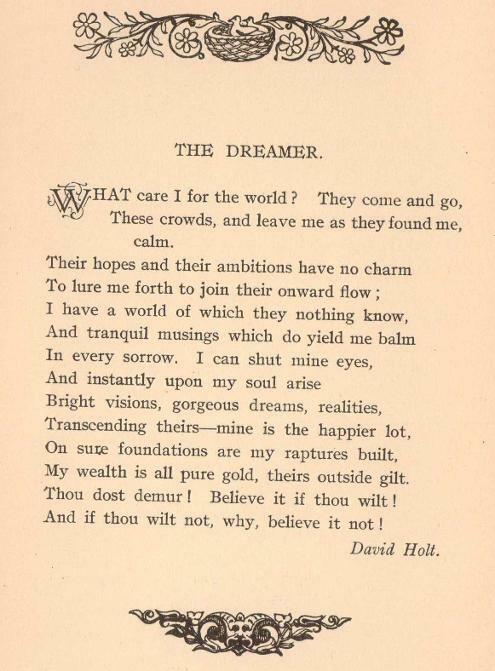 This sonnet rather appealed to me as it seems apt in the context of today's overcrowded, materialistic and celebrity-obsessed world, although written over 160 years ago. And beautiful wreaths they be. On our silent missions we go. By a spell unseen but strong. Our carved work and icicles. Till the sinful earth seems pure." 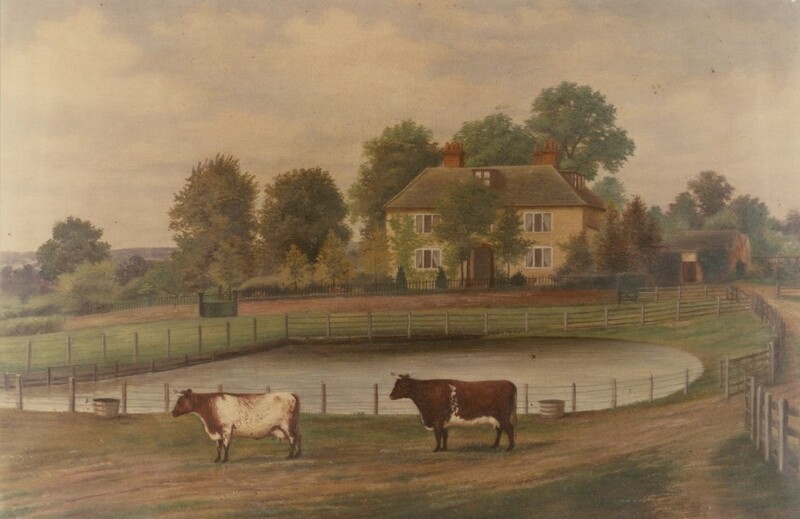 A painting (c1860) of Whitley Park Farm, near Reading in Berkshire, where John Benwell, grandfather of Joseph Austin Benwell, John Benwell jnr, William Arnee Frank and David Holt, was born, and where their great grandparents and 2xgreat grandparents lived in the 18th century.